Behind the modern, comfortable presentation of Cannon Hall Country House Museum lie tales of war, revolution, murder, migration, poverty, theft, injustice and the role of women in the social turbulence of 17th century Yorkshire. Can we combine history research with contemporary art practice to represent the past in today’s landscape? 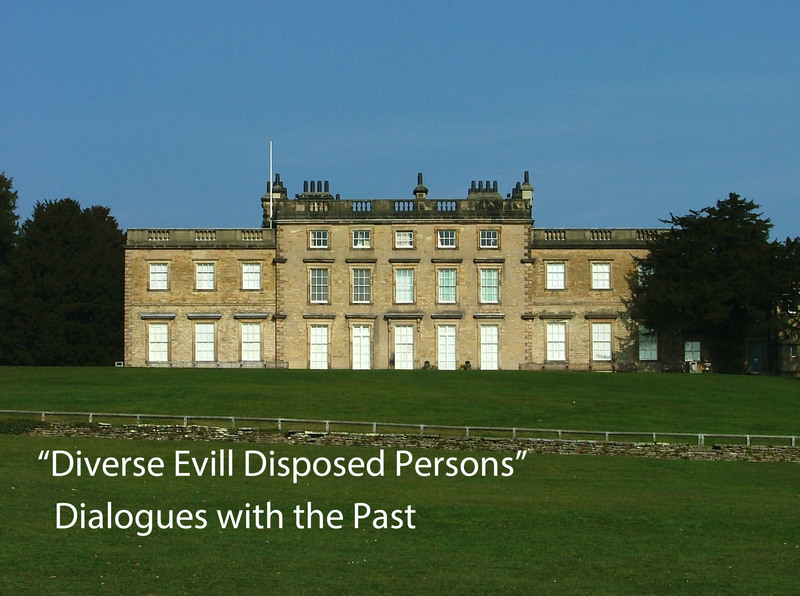 Do these ignored stories surrounding Cannon Hall have any relevance to life in the 21st century? What chance does such an ‘alternative history’ have of being seen and heard? Pat and Martin Bashforth will use a variety of media to explore and present their research into the past and present of Cannon Hall and its surrounding landscape and invite your answers to questions like these. There will be no open meeting during August. The next one is scheduled for Wednesday 25 September, so pencil it in your diaries and watch out for the notice. Meanwhile, various things are being organised. On Monday, 30 September at the Golden Ball from 7.30 there will be the next joint meeting organised by York Alternative History and York Social. Nick Smith will be leading a discussion on ‘A History of Englishness’. It will look at how and why England was created as a kingdom/country; the political motivation, spin, propaganda and creation myths that established England and what it means to be English. He will link this to how nationalist groups use these ideas from the early Middle Ages. If you have been watching the recent series on TV about ‘King Alfred and the Anglo-Saxons’, this will be a fascinating alternative view. On 17 October, there will be an Anti-Slavery Film Evening. Put that date in your diary and watch out for more information. Some time in the autumn, there will be a new initiative that will get us out into the public domain in a high profile way. We will be involved in a project that will critically engage the public in thinking about York and how ‘Heritage’ affects the city and its people. Watch this space for further announcements. This will give us the chance to challenge the ‘authorised heritage discourse’. Two big things for autumn 2014. We are helping out with events to do with the commemorations of the ‘Great War’ that was supposed to end all wars and in fact laid the foundations for most of the ones ever since. On our own efforts we will also be doing something similar to only different from our Luddite event last January: we will be looking at the way Guy Fawkes has been characterised through ‘heritage’ and used by the activist movements in recent years. The next open meeting of York’s Alternative History will be at the Golden Ball, Cromwell Road, York on Wednesday 24 July from 7 to 9 pm. You are all welcome! During the past week, the Rowntree Foundation, the York Press and the Archbishop of York, John Sentamu, have each drawn attention to the poverty and hardship that underlies and, through high rents and low pay, underpins the superficial prosperity of the City. York continues its transition from a manufacturing centre to a twin-track economic structure in which a low-paid sector provides services to tourism, finance and a high-tech and academic elite. As factories close, cafes and restaurants seem to mushroom. Much of this false economy, which includes the East Coast Main Line commuters attracted to live here while working in London, exploits a fanciful and skewed interpretation of York’s historic fabric. What is superficially entertaining and good to look at is foregrounded, while submerging and ignoring the ordinary people of York and their experience – not just in the past, but equally in the present and in formulating policies for the future. Challenging this ‘chocolate-box’ version of York’s past is what YAH is all about. We campaign about history and heritage in parallel with other forms of social and cultural activism. How the past is presented is part of today’s social problems and the prevalent inequality. We are planning events for more than a year ahead and welcome new ideas to help us shape our agenda and make our small voice louder and more colourful. Help us plan this year how to challenge the way Guy Fawkes is presented and next year how the ‘Great War’ to end all wars is going to be commemorated. Help us devise a programme of public talks, events and interventions. See you on Wednesday! General Ludd Embraces New Technology! Those readers who followed our events in January to commemorate the execution of 17 Luddites at York Castle 200 years before, will remember Alan Brooke. He was one of our speakers during the afternoon discussion at the Guildhall and, dressed dapperly in early 19th century dress, added a splash of colour to our commemorative event at the Castle, along with his comrades. If you are alert to the mass media, you may have heard him eloquently represent the Luddite cause on Radio 4 (Looking for the Luddites) and on BBC TV (Nick Crane’s programme on Huddersfield in his Town series). Now you can find more of his quietly authoritative words on the blogosphere. Check him out on ‘Underground Histories’ at http://undergroundhistories.wordpress.com – it’s well worth the visit. The next open meeting of York’s Alternative History will be on Wednesday, 19 June at 7 pm at The Corner Pin, bottom end of Tanner Row, York. Please note the change of venue!! There is lots to talk about – the latest developments in planning to counter-act the State’s ‘Great War Fest’ in 2014, ideas for the next pub discussion meeting following the successful one on the Suffragettes, what to do about the way Guy Fawkes is commemorated, how what we do links to present day activism, and some other great ways of challenging ‘Heritage York’ on behalf of the living! Everyone welcome. See you there. 2014 – The Commemoration to End All Wars? By Jingo! For radical historians and anti-militarist activists, the official commemoration of the First World War in 2014 represents a huge challenge. Perhaps it is also a huge opportunity. There is hardly a community or a family that does not have a connection to the First World War. They will not just be looking back to the past. They will be aware of the wars going on around us – the legacy of what was supposed to be ‘the war to end all wars’. The Government is already putting itself into a position to control the way in which it is ‘celebrated’, much as it has done since 1919 (read more of this below). Opposition is already growing to the State’s official plans. An open letter and petition has been launched through the Stop the War Coalition. You can sign up your support at http://ww1.stopwar.org.uk/ . But you can do more than this to help. All round the country, activists and radical historians are planning their own events to try to counter the inevitable jingoism. They have started an email discussion group to share ideas and plans. York Alternative History will be part of this movement of cultural resistance alongside other groups in the city. Come to our next meeting and add your active support to what will be happening. Plans are already under way for a day school and for a series of films. More ideas are needed. NEXT MEETING: Wednesday, 19 June, at 7 pm in THE CORNER PIN, Tanner Row, York. There is a massive disparity in terms of resources between officially sponsored events and those that radical and alternative groups will be able to muster. The Coalition Government has announced plans to arrange a long series of commemorations related to the First World War, starting in 2014, the centenary of its outbreak. They are replicating what was done in 1919, when the popular desire for Remembrance was hijacked by the State and the Church. They have already set aside some £55 million. The lion’s share of the cash (£35 million) has already gone to the Imperial War Museum for renovation work. More than £5 million is to be pumped into the school system to take maintained secondary school children to the ‘great battlefields’. The DCMS includes in its sums £15 million which actually comes from the Heritage Lottery Fund (see below). The spend will not stop at £55 million, as none of this figure includes future events yet to be decided upon. The DCMS has appointed a ‘prestigious centenary advisory board’ to oversee events yet to be planned. Of the 16 people so far nominated, there are only two historians, both right wing military specialists. There are five politicians, all right wing and/or with backgrounds in defence affairs, including another military historian. There are four representatives of the armed forces, all retired chiefs of staff. The Church is represented by the Dean of Salisbury, while ‘cultural’ influence is confined to two writers, Pat Barker and Sebastian Faulks, both authors of sentimentalised representations of the First World War, and the President of the National Library of Wales. Scotland is not represented – they have their own Five Year Plan. Other powerful bodies will be adding their weight to these State sponsored events. Top of the list is the archaically titled Imperial War Museum, which is encouraging local community events and has its own dedicated website already in operation at http://www.1914.org/ . Numerous local projects have already joined in, alongside historical associations of one sort or another. Should we be a part of this, inside the tent as it were? Funding for these projects is available through the Heritage Lottery Fund in blocks from £3k-£10k, £10k-£100k, and over £100k. They claim to have already issued over £12 million to related projects since April 2010. Much of the larger grants will be going to museums and other official bodies to fund their own projects. The HLF don’t say how much money they have in total for this aspect of their work, but the DCMS says it is ‘at least £15 million’, of which £6 million is specifically targeted at young people. Does this represent an opportunity for radical groups to test the waters as to whether or not we can access this type of resource? York’s Alternative History and York Social Pub Talks joined forces last night, 20 May, at the Golden Ball pub, to present Krista Cowman speaking on ‘Suffragette Militancy in the Regions’, sparking off a lively question and answer session and discussion to follow. The event was in commemoration of the time in June 1913 when Emily Wilding Davidson fell in front of the King’s horse at the Epsom Derby, dying of her injuries a few days later. We were also celebrating the less well-documented bravery of thousands of women, including several from the York area, risking reputations, health and their lives for the right to have their voices heard in British political life. Succinctly and entertainingly, Krista Cowman explained the context and reasoning behind the growing militancy of the suffragette movement in the years preceding the First World War. She drew attention to the risks the women took, to their extraordinary personal courage and, quite naturally, this posed the question as to whether their militancy and superb organisation achieved worthwhile results. Questions and discussion centred around the issues of success and organisation, and it is fair to say that the debate continues. Issues in history like this are never definitively resolved, though they are always relevant. I would note a few personal observations. Without the combination of firm resolve and dedication, backed with a highly effective national network of supporters, the women’s suffrage movement could not have supported the degree of militant activity they undertook. That is a lesson for today’s advocates of ‘direct action’ and civil disobedience, in the absence of any such background organisation. Equally interesting and relevant to today’s movements was the way in which the police authorities evolved new methods of surveillance in response to the women’s suffrage movement, at one point seizing the WSPU’s records, which were never returned. No matter how today’s movements organise, the police will find ways of adapting their tactics and strategies to protect the interests of the State and the status quo. Witness present-day debates about infiltration of groups, abuse of personal relationships (not just by the police, it is fair to say) and kettling of peaceful demonstrations. For certain, the WSPU and its offshoots and rivals remain a quite amazingly relevant focus of debate about how best to organise for a better world. Krista provided some useful advice on the sources of information in public and private archives for those willing to the research. Krista Cowman set the bar high for whoever undertakes the next joint talk we host! Log on to this site for future events. Krista Cowman is Professor of History at the University of Lincoln, a founder member of the Women’s History Network, and author of numerous publications, including the Borthwick pamphlet on Suffragette Militancy in York.